"I don’t know why you’re gone, but I’m positive we will be together again. This love is too strong." 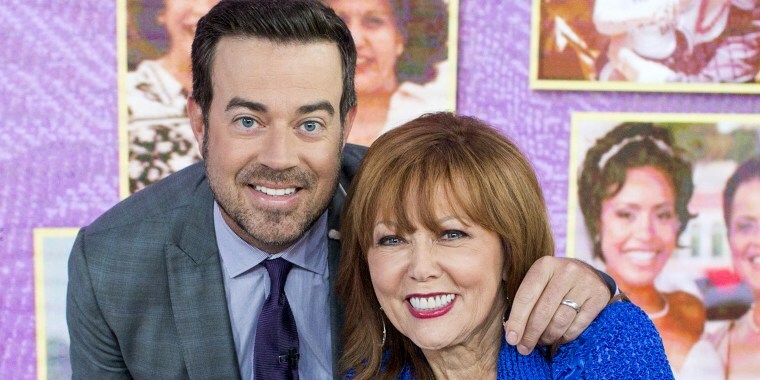 Carson Daly marked the one-year anniversary of his mother's death with a touching message of everlasting love on Monday. The TODAY anchor also received an emotional reminder about her death as he got set to work at Monday night's Emmy Awards, where he received the call last year that Pattie Daly Caruso, affectionately known as "Kiki," had died at age 73 of a heart attack. "1 year later I’m still reeling over the loss,'' he wrote on Instagram. "I slept in the same exact hotel bed last night where I got the call. At The Emmys. Surreal. I miss you everyday and love you always. I don’t know why you’re gone, but I’m positive we will be together again. This love is too strong." Caruso was a well-known California TV personality and breast cancer survivor who was recognized in 2005 for her notable career that included interviews with everyone from President Donald Trump to golf legend Arnold Palmer. Monday marked the latest emotional milestone for Carson and his family since her death. He also posted a heartwarming Instagram message celebrating his mother's life on what would have been her 74th birthday in March. The family has also endured the loss of his stepfather, Richard Caruso, who died five weeks after his wife from bone cancer. Carson has often spoken about how his mother served as his inspiration, having previously opened up about her influence on him for TODAY. Monday's remembrance is the latest among multiple tributes he has posted since his mom's death, including a photo of her star on the Palm Springs Walk of Stars. Carson's wife, Siri Daly, also posted a sweet message on Instagram Monday in memory of Caruso. "My mother-in-law loved to get dressed up and attend a fancy event, but more than that she loved to be by her son’s side...beaming with pride,'' she wrote. "Today, a year after her death, I strive to make her proud as a wife, and a mother, and a human. She never wasted a minute telling the ones she loved how much she cared...and we all still know. I can feel how proud she is of @carsondaly today, and everyday."